Two design students team up to transform a Somerville couple's guest room from drab to fab - on $500. In many homes, the spare room functions much like a spare tire: It's there when you need it, but you're probably not going to be showing it off anytime soon. That was the case at Mandy and Aru Manrique's first home, a two-bedroom condo in a two-family in West Somerville. Since they moved into the unit in August 2006, the young couple had found innovative and inexpensive ways to redecorate the living room, dining room, and master bedroom themselves, but their solution for the spare room was to keep the door closed. "We have done nothing to this room, besides move stuff into it from the other rooms as we worked on them. It is the catchall for everything in the house that does not have a home," Mandy, 28, explains. "I have been struggling with how to make it a functional and beautiful space." The Manriques needed the impossible: a complete decor overhaul on the cheap. The Globe Magazine decided to help. 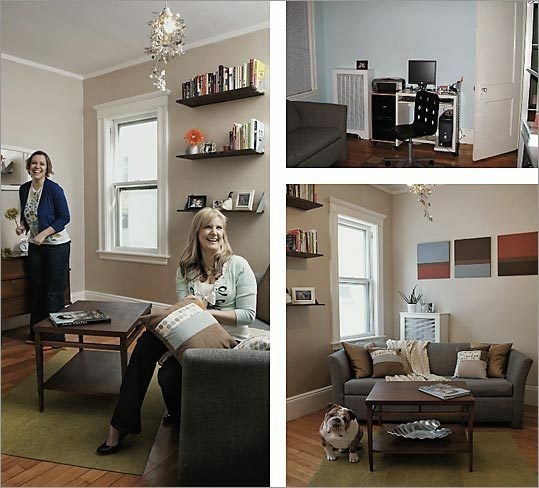 We gave two master of interior design candidates at Boston Architectural College - Becky Boyer, 29, and Melinda Cabanilla, 32 - $500 to transform the couple's cluttered "catchall" room into a welcoming place for guests. "A lot of people say you can't do a makeover for $500," says Cabanilla, who practices frugal design in her own apartment. "Students like us, we can do it on a budget." There were a few obstacles. First, the designers decided that most of the room's existing furniture, including a bureau and shelves, would have to go. The height of those pieces and the positioning of others, like the sleeper sofa, made the room appear smaller than it was, Boyer explains. Dominant hues of blue and gray made the space seem dark, too. "You didn't want to be in here," Cabanilla adds. "Our goal was to work with the space to try to make something interesting for them, because they have a really great little apartment," Boyer says. "We wanted to keep the fact that it was a guest bedroom, and also make it a den-type space to relax." Boyer and Cabanilla discovered some suitable accessories - such as a large mirror - hidden in the couple's storage areas. They also added a few newer items, like wooden shelves from IKEA that mount to the wall to save on floor space. The final, redesigned room includes all of these pieces set off by walls newly painted light beige, one of which has a barely perceptible metallic glaze on it that adds a golden glow to the room. The couple's pull-out couch, once crammed against the wall, is now positioned at an angle, opening up the room and making it feel larger. Chartreuse-colored Flor carpet tiles, bold wall art, and throw pillows sewn by Cabanilla add bursts of color to the space. And funky accessories - like a small container decorated with a dog's face that bears a striking resemblance to the Manriques' English bulldog, Tank - personalize it. The result is a combination of Cabanilla's eclectic tastes and Boyer's modern design aesthetic. But, perhaps most important, the room seems to fulfill the owners' needs. "I really love the layout of the space; it's so much more inviting and comfortable," Mandy says. "I also love the new furniture, the wall art, and the accents of 'us' that they added into the room. Makes it very unique."